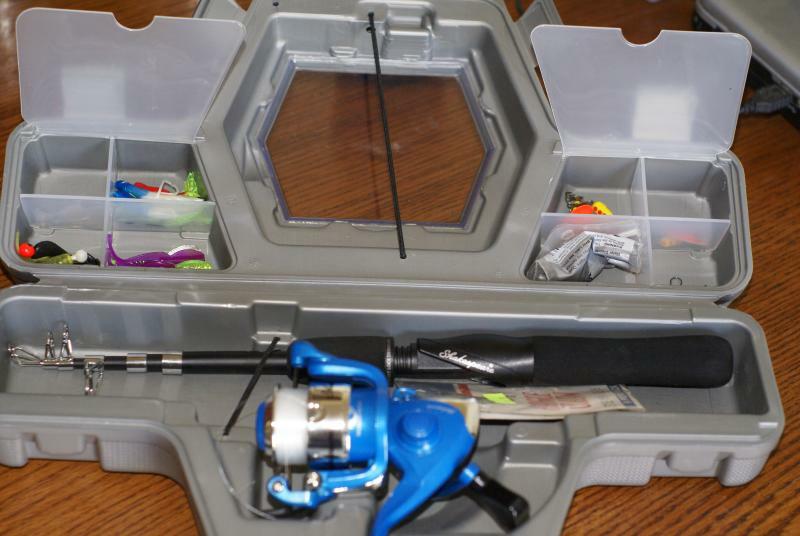 This 5 1/2 foot light action telescopic rod and reel combo comes in a hard plastic case that has two compartments for tackle so you can keep a few spinners, or other lures you like with the rod. The size is small enough to fit easily behind or under the seat in your vehicle and will not take up a lot of room in a back pack for a hike into the high country. This would be a great kit to take along on a wilderness camping or hunting trip. The reel with this combo comes spooled with 195 yards of 4 lbs. test mono filament that is perfect for the size fish that you will typically catch in the ponds and creeks here in Idaho. We are fortunate to have many Family Fishing ponds around the treasure valley that are stocked frequently by the game department with Rainbows in the 8 to 12 inch range. These fish grow quickly in these ponds and can get a lot bigger fast, but they are still easy to catch on 4 lb test line. Most of the ponds are also loaded with Bluegill and the 4 lb test line is perfect for the small jigs and egg hooks that are used for these little pan fish. The reel also has the easy cast feature that I like. This feature is a lever mounted on the line winder that is easy to grab with your finger as you grab the line to cast. The lever flips the bail out of the way so you can make the next cast. The reel is designed so that the easy cast lever will always line up under the rod in position for the next cast when you move the handle backwards. After a few casts with an easy cast reel you will not want any spinning reel without the easy cast feature. This morning I took the Travel Mate to the Family Fishing pond just down the road from my house. It was a cool, rainy, windy morning so my wife and I had the pond to ourselves. There were fish jumping and boiling all over the pond. We spent a few hours fishing and caught 3 nice 12 inch Rainbow’s The Travel mate was easy to set up and easy to cast. The reel is smooth and quiet during both the cast and the retrieve.The rod is sensitive enough to feel even light strikes and the light action makes the fight all the more fun. Overall I am pleased with this new rod so far. I intend to put this rod to the test many more times this summer and see just how well it works in all situations. If you are looking for an inexpensive travel rod to keep around I recommend you check out the Shakespeare Travel Mate kits. 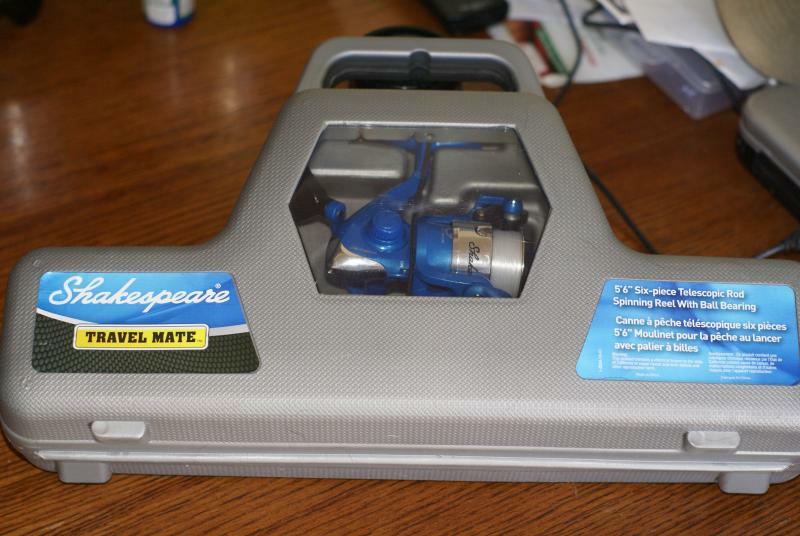 This entry was written by Jeff, posted on April 2, 2011 at 2:55 pm, filed under Fishing, Product review and tagged blue gill, cool, family fishing, fishing, idfg, lures, rain, shakespeare, spinners, travel mate, trout, wind. Bookmark the permalink. Follow any comments here with the RSS feed for this post. Post a comment or leave a trackback: Trackback URL.